President Mark Kennedy gives remarks at the start of the most recent Strategic Planning meeting Tuesday, Jan. 31, in Wilkerson Commons. Photo by Richard Larson. 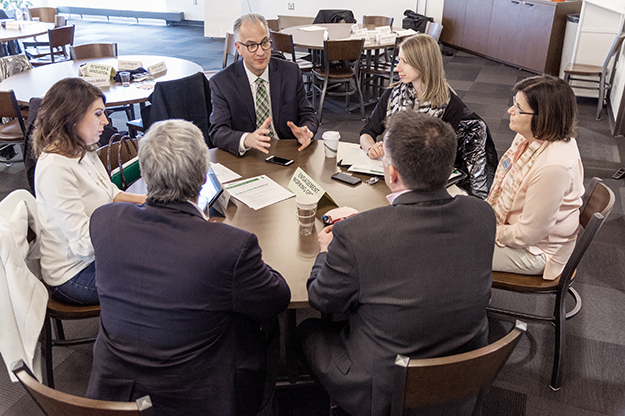 When UND’s Strategic Planning Committee met for the first time last fall, they knew their charge was a lofty one—setting the course for the premier flagship University in the Northern Plains by establishing core values as the foundation of campus priorities. They didn’t know just how integral those determinations would be in the months to come. As UND faces a proposed 20 percent decrease in state funding, the Strategic Planning Committee has its eye on the horizon, identifying what investments in key priority areas would allow it to better fulfill the purpose of the University—delivering opportunity through learning, discovery and engagement. At this point in planning, an estimated $7 million in investments are believed to offer a significant payback by benefiting students, while attracting more students and research to UND. Research and discussion by the committee found that doubling efforts to ensure students master key intellectual skills and graduate in a timely manner would simultaneously benefit graduates and enhance UND’s attractiveness as a place to study. A robust marketing effort would attract more high quality students to benefit from UND’s programs. Upgraded High Performance Computing capabilities and the creation of an Unmanned Institute would enable interdisciplinary research opportunities that help move the state beyond oil and soil. 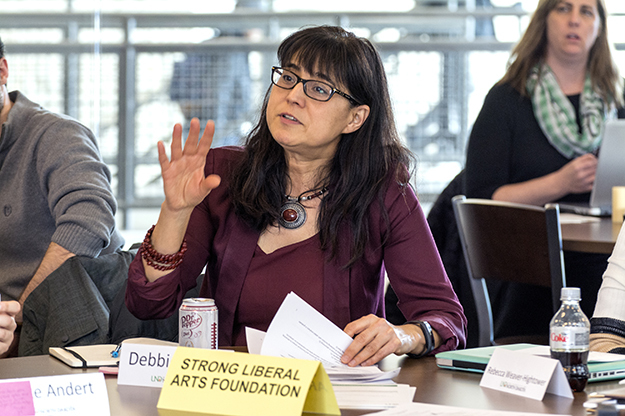 Debbie Storrs, dean of the College of Arts & Sciences, offers comments during Tuesday’s Strategic Planning Committee meeting. Photo by Richard Larson. One of the goals set by the Strategic Planning Committee is boosting stagnant enrollment numbers. To do so, the committee has suggested an emphasis on marketing—earmarking funds for a branding study, increased advertising, and a website upgrade that would make UND.edu more reactive and mobile-friendly. Increased tuition revenue from the resulting enrollment growth would be available to invest in other priorities. “It helps us differentiate ourselves in a highly competitive environment. It allows us to better showcase our strengths,” said Strategic Planning Committee co-chair Dana Harsell. The committee is also developing a set of five “Grand Challenges” on which to base the campus’ multidisciplinary research efforts. These are issues that are critically important to the region and the world that UND is poised to solve, such as promoting energy security, helping rural communities with health and social issues and focusing on research in cancer, neurodegeneration and infectious disease. The proposed Grand Challenges also include driving developments in Big Data, cybersecurity and Unmanned Systems. For increased research in these areas, UND is looking to invest in a North Dakota University System initiative led by Chancellor Mark Hagerott called NexusND, which would bring more High Performance Computing and cybersecurity infrastructure and experts to campus. President Mark Kennedy (center) sits in on a table discussion at the second half of Tuesday’s Strategic Planning meeting. Photo by Richard Larson. The work of the Strategic Planning Committee is far from done, and the strategic plan itself is still a work in progress—no final decisions on exact investments have been made. But the priorities that the team has set will play a large role in budget decisions to be made in the coming weeks. “Given the immense pressures that come with the budget reductions, and given their already increased workloads, I couldn’t ask for a better group of engaged people who are trying to look to the future of how we position the University of North Dakota,” Betting said. 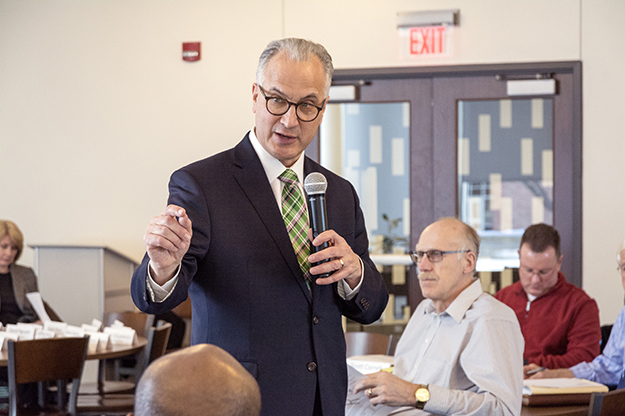 “I have been impressed with the degree to which the Strategic Planning Committee has reached out broadly across campus for input and how they have earnestly pursued actions to elevate UND’s status as a premier flagship,” Kennedy said. More Campus fora will be held in the coming weeks to discuss the latest updates to the evolving strategic plan. More information can be found at the UND Strategic Planning website.